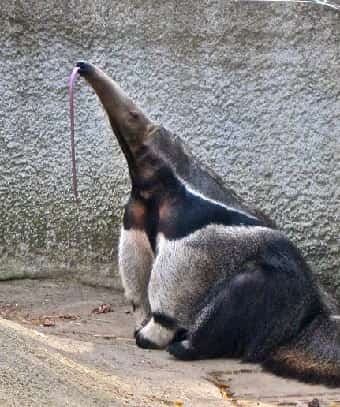 One of the oddest looking of all South American animals is the Giant Anteater (also spelled Giant Ant Eater). On this page of Interesting Animal Facts you will find information listed about this interesting species. This material is written for kids and adults alike to find answers to such questions as how the Giant Anteater has adapted for survival, where it lives, and what it looks like. Click here for a great selection of Amazon.com books about Giant Anteaters. This animal is also called the ant bear. Its scientific name is Myrmecophaga tridactyla. The generic name Myrmecophaga is Greek for "anteater" where as the specific name tridactyla is also Greek and means "three fingers". This animal is native to South America and Central America. The Giant Anteater is the largest of four species of anteaters living today. The Giant Anteater is terrestrial (stays on the ground) whereas the other three species of ant eaters are arboreal or semi-arboreal (live in trees part or all of the time). These animals have poor eyesight and rely mostly on their sense of smell, which is 40 times keener than humans, to find food. They feed on a variety of insects including ants and termites. When scooping up insects its tongue moves in and out of its mouth approximately 160 times per minute which is almost three times a second. They can eat up to 35,000 ants or termites each day. Having no teeth they crush insects on their palate before swallowing them. These animals swallow at higher rate than most other mammals. They live up to fourteen years in the wild and sixteen years in captivity. This animal actually walks on its front knuckles like gorillas. Large predators like jaguars and pumas prey on the Giant Ant Eater. The International Union for Conservation of Nature (IUCN) has listed this species as Vulnerable to extinction. A serious threat to its survival is poaching. It is hunted for numerous reasons including for food, sport, its hide (used to make equestrian equipment in some countries), and for protection (although generally not dangerous if threatened they can kill humans). Destruction of its natural habitat is another threat to this animals existence. Its most prominent feature is its elongated snout. They have long tongues which they can stick out more than 2 feet (60 centimeters). Their tongue is covered with sticky saliva which insects get stuck to. Their length ranges from 5.97 - 7.12 feet (182 - 217 centimeters). Males of this species weigh between 73 - 90 pounds (33 - 41 Kilograms); females weigh between 60 - 86 pounds (27 - 39 Kilograms). They have a brown tail with very long hair. They have long sharp claws used for ripping open anthills to get to their prey. Their fur coat is basically grey. The front legs are white and have black bands circling the wrists. The back legs are usually a dark color. They have a mane stretching along their back. Black bands reach from their throat to their shoulder and are outlined in white. In relation to its body it has small eyes and ears.